Larry Thomas Hand was born July 10, 1940 in Paterson and grew up in the nearby town of Butler. Larry was a late bloomer size-wise. When Larry enrolled at Butler High School in 1955, he stood 5’6” and weighed 135 pounds. He participated in JV football during high school, but never started for the Bulldogs varsity. He made the team as a senior, spending most of the games on the bench. After graduation, he stayed in shape working as a mason for a company in Butler and playing sandlot ball. Eventually he grew to 6’4” and 220 pounds. Larry didn’t think much about college until 1960, when he was offered a chance to play for Appalachian State in North Carolina. He was accompanying a friend to the Boone campus for a tryout and caught the eye of coach Jim Duncan. An injury kept Larry off the field much of his freshman year, but his final three collegiate seasons he was an all-conference defensive tackle. NAIA rules at the time limited substitutions, so Larry often played tackle on both sides of the ball. He was an NAIA All-American pick as a junior in 1963 and was honored as First-Team All-American as a senior in 1964. His #71 later became the first jersey retired by the Mountaineers. Larry played his final season at ASU knowing he would probably play pro ball. In the spring of 1964, Larry had been selected by the Detroit Lions in the 10th round of the NFL draft. The Jets took him in the 21st round of the AFL draft. Larry was eligible because his class had long since graduated. Larry signed with Detroit, backed up defensive end Sam Williams and played on special teams for two seasons before becoming a starter in 1967. That year, he picked off passes in back-to-back games, against the Cardinals and Packers returning each for a touchdown. It marked the first time a defensive end had accomplished this feat. A promising 1968 season was cut short when Larry injured his knee in the opener against the Cowboys. In 1970, Larry intercepted his third pass and returned for another touchdown. He was key part of a Lions defense that allowed just 202 points and led the team to a 10–4 record and Detroit’s first playoff berth since 1957. Larry was joined on the defensive line by Alex Karras and played in front of linebackers Wayne Walker and Mike Lucci. The defense got the job done in the playoffs against Dallas, but the offense got nowhere. The final score was 5–0 Cowboys. 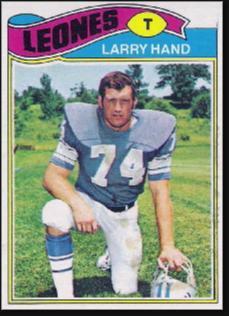 After another knee injury in 1974, Larry moved to defensive tackle in 1975. He played through the 1977 season before calling it a career at age 37. Larry and his wife, Darlene, moved back to North Carolina and got into the banking and investment business. He lives in Winston-Salem.